The parable of the dishonest servant is one that could easily cause us confusion. On the surface it looks like Jesus is extoling the dishonesty of the steward. Yet when we hear what follows we recognize that Jesus is not using the dishonest servant to give the disciples an example to follow regarding dishonest wealth; rather, he is making a comparison and calling to greater commitment to discipleship. He uses the parable and the character of the dishonest servant to demonstrate the great extents someone will go to so that they may preserve their status or wealth or position. The dishonest servant goes to great effort, albeit dishonest and corrupt, to cover up his duplicity and greed and thereby maintaining his job and ill-gained wealth. The dishonest servant, when he learns of his master’s intention, contemplates his situation, makes a plan then immediately acts to complete it. All this to maintain something that is not only ill gained but is fleeting and temporary. Jesus uses the parable to have his disciples — that includes us — to reflect on the efforts we make not so much with wealth, position or status but the things that really matter in life. The dishonest servant’s master was not so much his employer or overlord but the wealth and position he provided. This is the driving force behind the servant’s life. Jesus uses this example to prod his hearers to reflect. If this dishonest servant can spend all this effort and energy in something dishonest, what would be possible if those efforts were placed in seeking something good, honest and truly life giving? Jesus says: “No servant can serve two masters. He will either hate one and love the other, or be devoted to one and despise the other. You cannot serve both God and mammon.” This saying of Jesus is at the heart of the message. Wealth, position and status provide an illusion of happiness or success. Many people are attracted by this and put great efforts in achieving one or all of these. What inevitably happens is the person gets lost in life. As the desire and pursuit of these becomes prominent in their lives they move further and further away from God and his offer of life. The dichotomy between the two masters is clear. In the fourth Gospel another image is used: “worldly” and “other-worldly.” While we live in this world we do not have to be consumed by it. There is something greater to which we aspire. The life that God gives us here and now leads to something even greater. The path of discipleship leads us along the right path, the path to life. Jesus invites us today to reflect on our discipleship. What is the path we walk? Who is it that we follow? Who is our master? Perhaps for some there are clear and direct answers. For many, however, there will be a recognition that discipleship involves a continual movement away from one and toward the other. Jesus calls us to invest ourselves in this movement toward him and the life he offers. The dishonest servant is not to be imitated in his dishonesty but in his zeal and ingenuity. Jesus wants us to put this kind of effort into walking the path of discipleship. Thank you Msgr. 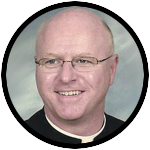 Prior, your homilies are always spot on! I enjoy reading them and reflecting on the message. I am currently studying @ Saint Charles Seminary for the permanent deaconate in year 4. I am a parishioner at Our Lady of Guadalupe. Thanks again and I look forward as always to your next homily.